A 38-year-old woman, 37+3 weeker was incidentally detected to have fetal cardiomegaly during 36 weeks ultrasound and referred for fetal echocardiogram. Antenatal history and anomaly scan were normal. Fetal echocardiogram showed heart rate of 153/min, sinus rhythm, situs solitus, levocardia, dilated right atrium and ventricle with venoatrial, atrioventricular and ventriculoarterial concordances. All cardiac valves were normal; cardiac crux was intact with separate mitral and tricuspid annuli (figure 1A–C and online supplementary video 1). Mild tricuspid regurgitation with peak velocity of 1.77 m/s was noted. There was no evidence of Ebstein’s anomaly. Interventricular septum was intact. Pulmonary veins were seen entering left atrium (LA) without a retrocardiac chamber. Both aortic and ductal arches were adequate but with significant flow reversal visualised in descending aorta. Three-vessel view showed dilated right superior vena cava (SVC) with normal spatial arrangement and sizes of aorta and pulmonary artery. Patent foramen ovale and patent ductus arteriosus were shunting normally. Inferior vena cava (IVC), hepatic and portal veins were normal. Significant hepatomegaly was seen without any evidence of hydrops. 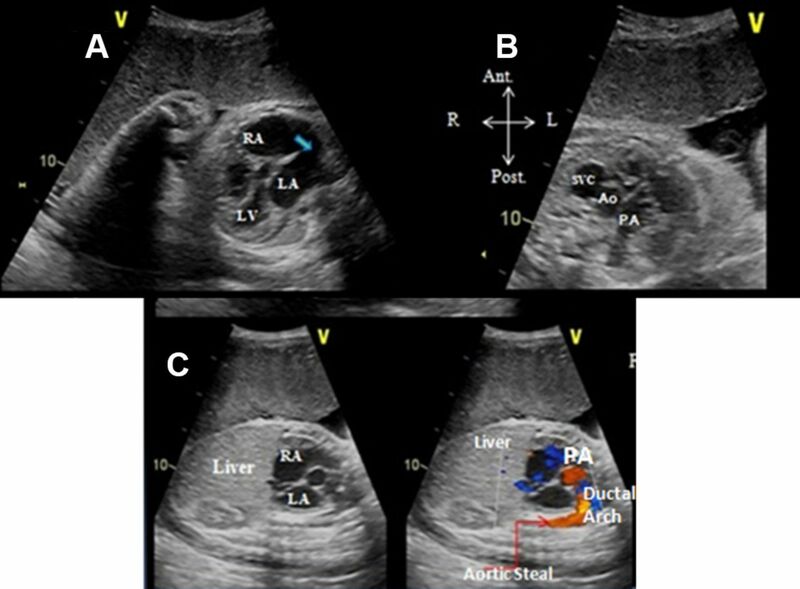 (A) Fetal echocardiogram showing atrioventricular concordance with right atrium (RA) connected to morphological right ventricle and left atrium (LA) connected to morphological left ventricle (LV). Blue arrow depicts a large foramen ovale shunting from RA to LA. There is no retrocardiac chamber behind LA. (B) Three-vessel view in fetal echocardiogram showing normal right to left arrangement of superior vena cava (SVC), aorta (Ao) and pulmonary artery (PA). Interestingly, SVC is bigger than its neighbours which is against the norm. (C) Fetal short-axis echocardiographic view showing situs solitus with normal arrangement of RA and LA. RA is draining into right ventricle which is draining through PA into the ductal arch. However, significant aortic run-off is noted in aorta. Question As per the available echocardiographic data, what is the most likely diagnosis for fetal heart failure? Supracardiac total anomalous pulmonary venous connection? Fetal vein of Galen malformation? Contributors MC was in charge of the patient. All the authors were involved in the discussion and preparation of the manuscript.